Germany is known for a few things, mechanics and knives among them. This knife sharpener is manufactured by Wusthof, a long-standing family business that has been in operation since 1814. Their knives and related products are renowned for their high quality and functionality. 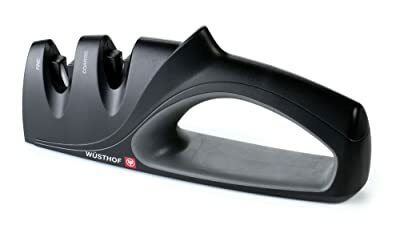 The Wusthof precision edge knife sharpener is a manual, 2 stage knife sharpener. With two stages, you can give your knives a professional sharpening right at home. The first stage sharpening system is made out of tungsten carbide, which works to set a precision sharp edge on your knife. The second stage is made of ceramic rods that smooth blade. The benefit of a two-stage manual system is that it allows you to sharpen your knives easily and efficiently without the hassle that some electric machines provide. This knife sharpener has a number of great features. The tungsten carbide blades are extremely durable, which makes this product long lasting because the material takes a very long time to wear down. The ceramic rods are also very capable at honing your blade to near perfection, so you can rest assured that you’re getting a sharp blade every single time. In terms of handling the product, it is small and hand-held, with a rubberized base that helps you grip. To prevent slippage while sharpening, the bottom is weighted. The overall size of the product is 9 x 1.5 x 3.5, while the weight is 1 pound, making it easy to store or leave lying around your kitchen. Lastly, one of the most important features of the product, especially if you have children, is that this product is completely safe to use. The blades fit snuggly into the slots when sharpening and the shape of the product keeps the blade away from your hand. In sum, this product is great for those that are looking to sharpen every-day kitchen knives. It lasts a long time, gets the job done, and is very easy to use. However, for those with high-end kitchen knives, it is best to not use them on this sharpener.